Starting at the Alpincenter in 2.450 m, you are still in high alpine environment on the Geißstein Trail but you will be surrounded by the green alpine pastures of this vegetation zone from the Langwiedboden onward. A section with many roots awaits a bit further down as soon as you reach at the timber line at the Wüstlau Trail where technically challenging passages must be tackled. Back in the valley, the tour continues leisurely to the valley station because freeriders and their bikes get of course uphill quickly and in comfort by cable car. The three freeride trails at the Kitzsteinhorn are perfect for enduro bikers. Mountain bike trails open again in summer 2019 (approx. mid-June to mid-September). Attention! There is construction site traffic on the agricultural roads from Kaprun to the Alpincenter at the Kitzsteinhorn during the construction of the 3K K-ONNECTION. Please be especially careful. Thank you for your understanding. Freeride mountain biker get what their heart desires on this almost natural trail with 5.2 kilometres in length and 600 altitude metres. The starting point of this trail is reached after a short ascent. A bike suitable for uphilling is recommended for this trail. The Bachler Trail ends at the picturesque Klammsee Reservoir. You return to the lower terminus via the access road to the glacier cable cars. The Wüstlau Trail leads on 7.7 kilometres and an amazing 1.070 altitude metres from the Langwiedboden downhill into the valley. Stamina and skills are required here. Freeriders must master alpine pasture ground, root-covered and rocky forest passages and one or the other hairpin bend in the steep section on this extra-long trail. 476 altitude metres must be conquered on this 3-kilometre-long high alpine trail with starting point at the Alpincenter in 2.450 m above sea level. The banked curves are taken at a racy pace and smaller jumps cover the trail. The Geißstein Trail ends at the Langwiedboden – but merges directly with the Wüstlau Trail. All important information for downhill rides by bike are available at the mountain bike info points directly at the access points to the trails. The rules for using the mountain bike route as specified on the information boards must be observed. Helmets are mandatory, protectors are recommended. The routes lead across technically difficult terrain which requires good control of the bike and technical skills. You use the trails at your own risk. No liability is assumed for any accidents. 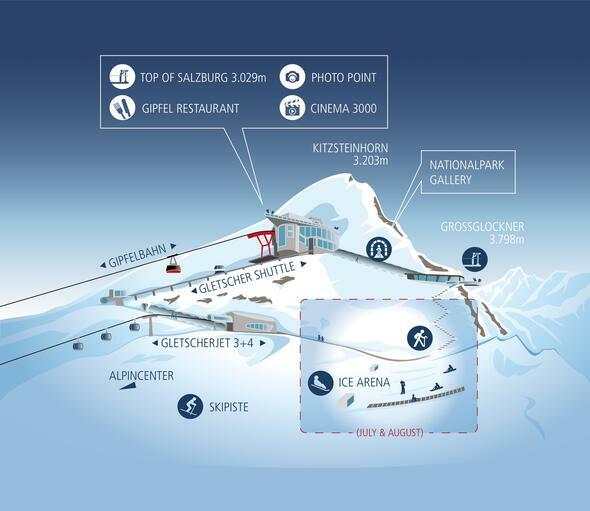 Mountainbike tickets valid on the Kitzsteinhorn depending on the snow situation from approx. mid June to mid September. Mountain bikes are transported free of charge to the Alpincenter. **The winter season ticket 2018/19 (season tickets 2018/19 bought at standard price for: Kitzsteinhorn-Kaprun, Zell am See, Saalbach Hinterglemm Leogang Fieberbrunn, Super Ski Card and Ski Alpin Card) can be extended against a surcharge for a bike season ticket.